The waterBOB is a water containment system that holds up to 100 gallons of fresh drinking water in virtually any bathtub in the event of an emergency. The waterBOB keeps water fresh and clean for drinking, cooking, washing and sanitation for up to 12 weeks. Constructed of tough, heavy-duty plastic, the waterBOB stays within FDA food grade guidelines and is BPA-free. 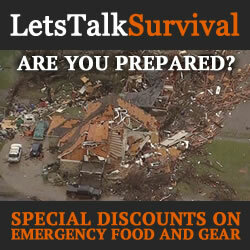 My tenet is that prepping has no more to do with a financial collapse, end-of-the-world event or a zombie apocalypse than it does with a simple power outage, earthquake, fire, flood, hurricane, tornado, or a long-term lay-off. It is about having plenty of food, water and emergency gear on hand for when you need it most, because it won’t be available otherwise. After some natural disaster hits a community, people rush to the store for bottled water before the shelves empty, but they are not always successful. We’ve seen it happen time and time again. People suffer needlessly because they fail to prepare. Clean potable water is likely the most difficult resource to come by immediately following a disaster. City water supplies are often unreliable because they are so easily damaged, or they become contaminated with harmful bacteria, pathogens or heavy metals rendering them completely unusable. Contaminated water can cause all kinds of waterborne diseases like Cholera, Dysentery, Typhoid and even Hepatitis. As a result, water storage is imperative to short-term survival. 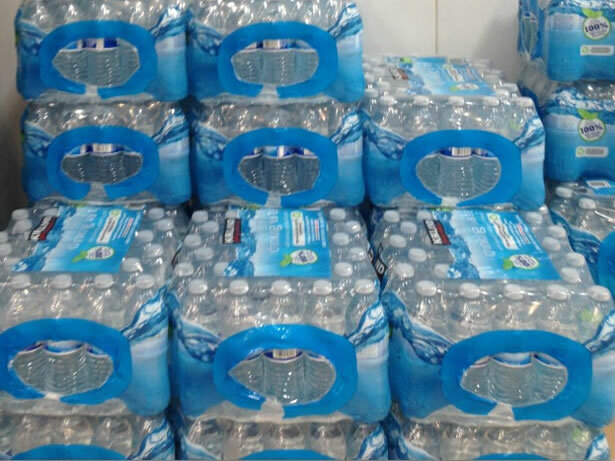 According to FEMA (Federal Emergency Management Agency), in case of an emergency every household should store at least one gallon of water per person per day capable of lasting at least a three-days. However, individual water requirements vary from person to person, depending on age, physical condition, activity and of course climate. Hot temperatures can more than double the amount of water necessary to survive. And if you have pets, don’t forget to allow at least a gallon of water per day for each pet. But what if you live in an urban environment without enough room to store large water barrels or more than a handful of gallon jugs and water bottles? Maybe you live in a condo or apartment with nothing more than a few small closets for storage. Sure, there are some stackable storage options like the WaterBrick that are designed to maximize limited storage spaces. But what happens if you needed more water than you have room for to cover your family over an extended period of time? The waterBOB might just be the answer to that problem. Most standard bathtubs hold approximately 60-70 gallons of water, and common soaker tubs can hold as much as 85 gallons. Like any pool or spa, a bathtub is a rugged storage container capable of holding a large sum of water provided the drain does not leak and it is truly clean, free of any dirt or soapy residue that can contaminate the water. The obvious challenge with open water vessels is keeping the water clean and free of debris, to limit evaporation, and in the event of an earthquake, to keep the water inside of the tub. The waterBOB is a patented temporary water containment solution that can hold as much as 100 gallons of clean potable drinking water in virtually any bathtub no matter the size or shape, yet it takes less storage space on a shelf than a small shoebox. It is made from an FDA compliant BPA-Free heavy-duty 10 mil food grade LLDPE (Linear Low Density Polyethylene) plastic chosen for its high tensile strength, durability and impressive resistance to chemicals, impacts and punctures. While its rugged construction and durable materials are certainly tough enough to withstand being filled to capacity without the support of a bathtub, the tub is highly recommended primarily for containment purposes. At only 10 mil, the bladder will always be in danger of accidental leaks caused by pets and sharp objects, not to mention the high-risk of spillage while it is being filled or emptied. Additionally, the ease of filling the bladder right from the tub spout is rather convenient. To keep costs down, the waterBOB is made by a large Chineese manufacturer with an outstanding reputation for producing dependable products. However, the company and its inventor, Tony Woodruff closely monitor the quality and dependability of the product. 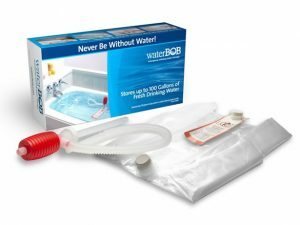 The waterBOB is quick and easy to use. 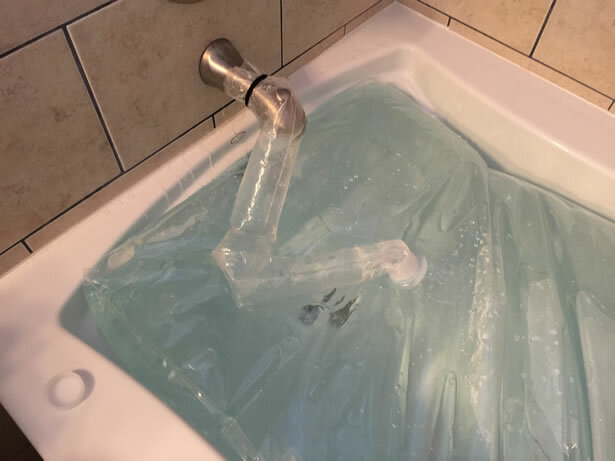 Simply lay the liner flat along the bottom of any standard or oversized bathtub with the two capped nozzles facing up on the side nearest the faucet end of the tub. Next, attach the fill sock to the nozzle closest the spout, and then to the spout itself. At that point, you can begin filling the bladder with cold water. You will likely need to hold the fill sock tightly in place to prevent it from leaking or slipping off the spout entirely. 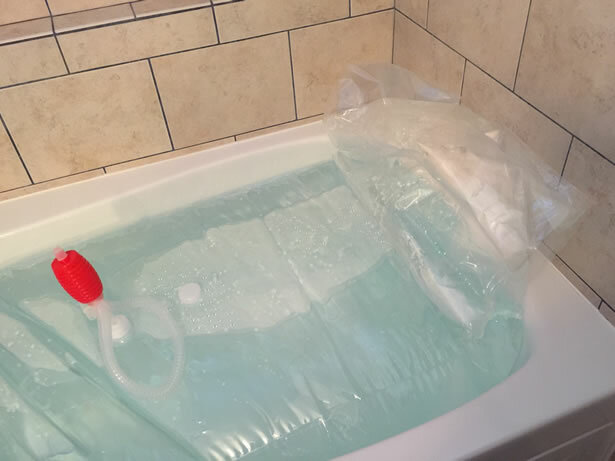 Depending on the water flow and the capacity of the tub, it should take somewhere between 20 and 30 minutes to fill entirely. Once it is full, shut off the water and tightly seal the white cap on the nozzle after removing the fill sock to prevent any contaminants from entering the bladder. To keep the water fresh for 16 weeks or longer, the water must remain cool and the bladder covered. 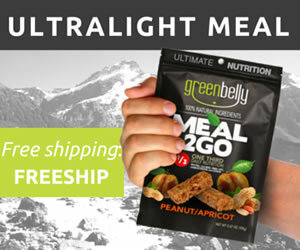 Direct sunlight and high temperatures tend to accelerate the growth of contaminates. It is highly advisable to treat the water immediately after filling the bladder with an uncented liquid chlorine bleach or water purification tablets like Aquatabs which can be found online and at most outdoor and sporting goods stores. Be sure to wait the specified time prior to use. If you are treating the water with bleach, use 2 teaspoons if the water is clear and 4 teaspoons if the water is cloudy or dirty per 10 gallons of water. Thoroughly mix in the bleach by agitating the water in the bladder. Then let the water stand for at least 30 minutes before using. A slight chlorine odor should be noticeable in the water. If not, add another dosage of bleach and allow the water to stand another 15 minutes. A plastic siphon pump with an 18″ flexible hose is included in every waterBOB kit to safely dispense water from the bladder. Simply remove the center nozzle cap and thread on the cap fixed to the siphon pump. To start the siphon effect, insert the hose in the empty container and squeeze the red bulb several times. To stop the flow of water, loosen the vent cap located on top of the bulb to break the siphon, then allow the remaining water to run out. But don’t forget to tighten the vent cap when you are done. When the water in the waterBOB is no longer necessary, simply slit the side of the liner and drain the remaining water. The waterBOB is intended for a single use and should be disposed of properly. However, if it was not damaged in any way and could be dried completely, it is possible that it could be reused. But the water would certainly need to be treated to insure safe consumption. I chose to put the waterBOB to the test in an oversized soaker tub measuring 52″ in length, 28″ in width and 18″ in height. Taking into account the curved sides and the slanted backrest, I figure the tub should hold about 90 gallons of water filled to the brim. The plastic bladder has an incredibly durable feel to it for being only 10 mil thick and all of the seams appear to be very secure, including the seams around the two nozzles. After spreading the bladder out along the bottom of the tub, a little over a foot of the bladder was left hanging over the edge of the tub. Certainly long enough for a 6-foot tub. 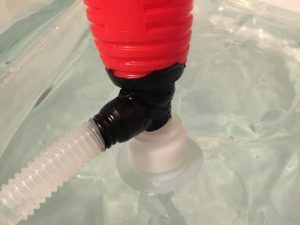 Next, I connected the fill sock to the bladder nozzle at one end and wrapped an elastic band around the other end, securing it to the spout so I wouldn’t need to hold on to it myself the entire time. As water entered the waterBOB, the bladder started to move around as it conformed to the shape of the tub. Once it was about halfway full, I noticed that the bladder had shifted in a way that partially blocked the fill sock causing some back-pressure which in turn caused the connection at the spout to leak, even with the elastic band holding it in place. I quickly adjusted it to relieve the back-pressure and it began to flow freely again. The bladder took about 30 minutes before reaching the brim of the tub when I shut it off and swapped the fill sock with the nozzle cap. I simulated agitating the water in the bladder by pressing up and down until the water began to roll heavily inside to test its ruggedness and was left very impressed. No matter how hard I pressed down, twisted or slapped the bladder, it simply rolled and flexed back into place. Then I swapped the nozzle cap nearest the center of the bladder with the siphon pump so I could begin emptying the bladder. I placed the end of the tube into a 5-gallon bucket and started the siphon by squeezing the bulb several times when I noticed some air leaking into the tube, which ultimately resulted in breaking the siphon shortly thereafter. I tried to start the siphon back up again when I noticed a small crack on the bulb itself. I also noticed the long tube was not permanently fixed to the pump body and air was seeping in there too. In an attempt to seal the crack and seam, I used some flexible electrical tape which seemed to help some, but not entirely. Air continually found its way in causing the siphon to break no matter what I did. I had two units to test so I opened the other kit and tried the other pump, but the second pump had the exact same result. Eventually, I pulled out my trusty Survivor Filter Pro with a built-in hand pump and it worked like a champ. However, it is a manual pump so I had no choice but to pump all of the water out by hand. Oh well… Even with treated water, I would still prefer to filter it anyway provided I had a filter available to do so. The waterBOB is a rugged piece of emergency gear that meets a very special need by providing anyone without room for permanent water storage with a temporary water containment solution that can be deployed and broken down at a moment’s notice making the waterBOB an ideal solution for dealing common public utility failures and serious natural disaster that plague us all from earthquakes and flooding to hurricanes and tropical storms, and everything in between. I have a large pool which is my primary water storage solution. My home just does not lend itself well to any kind of permanent storage solution like barrels or storage bricks. However, I am not too foolish to realize that I could easily lose more than half of my water in the event of an earthquake, and any water that does remain is sure to become contaminated almost immediately. Enter the waterBOB… If I can’t fill them from the spout, I can easily draw water directly from my pool, filter it and store it in them for later use. At a little less than $20 a piece, having a few of these on hand just makes perfect sense to me. It really is a game-changer in my mind. Especially for those who live in small homes, condos and apartments. Even small businesses and commercial buildings could benefit from having a few sitting on the shelf… Just incase. But I would also consider an alternative solution for pumping the water out of the bladder. I give it two thumbs up anyway!